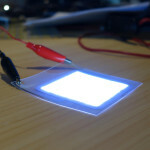 Rohinni has developed a form of what it calls ‘Lightpaper’: a way to print lighting and apply it to nearly any surface, in any shape, and for any situation. It’s more of a ‘platform of light’ rather than an ‘off-the-shelve’ solution. 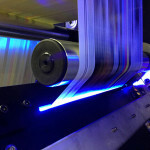 It unlocks the ability to create light, and the future fields of application are hardly known today. Rohinni uses 3D printing to create this thinnest light product in the world. Today, they are the only company working to 3D print paper using an innovative method combining ink and tiny LEDs which are printed out on a conductive layer and then sandwiched between two other layers, light up with LED current. Sections of diodes can be addressed, which is a whole other space when you start thinking about solutions of light that you can address sections of. 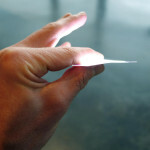 The magical thing about Rohinni Lightpaper is that this solution is brighter, it’s thinner, it’s flexible, it’s addressable, and programmable than for example OLED. The intention of Rohinni is to use this technology where it can make a big difference soon; everything from illuminating a logo on a mobile phone to providing headlights for a car.